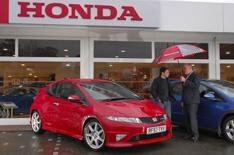 I started my time with the car wondering if Honda had managed to tone down the Type R enough to make it a more appealing day-to-day prospect, or whether it had stuck with the race-track set-up, which gave its predecessor such a cult following. The ride might have been toned down, but it still won't be to everyone's taste, as it remains on the firm side of uncomfortable, and it can be unbearable on patchy roads. It's easier to live with than the previous model was, though. The Type R is also spacious enough to be used as a family hatch, so it offers more than just B-road blasts. However, the ride (even though it's softer than the last car's) and woeful rear visibility will be enough to put some buyers off. Pity, because they're missing out on one of the rawest, most rewarding hot hatches on sale. The Civic Type R is still the real deal. A blast of a hot hatch that's surprisingly easy to live with.